This is a list of notable events in music that took place in the year 1963. January 3 – The Beatles begin their first tour of 1963 with a five-day tour in Scotland to support the release of their new single, "Love Me Do", beginning with a performance in Elgin. January 4 – At Cortina d'Ampezzo in Italy, Dalida receives a Juke Box Global Oscar for the year's most-played artist on jukeboxes. January 7 – Gary U.S. Bonds files a $100,000 lawsuit against Chubby Checker, claiming that Checker stole "Quarter to Three" and turned it into "Dancin' Party." The lawsuit is later settled out of court. January 11 – "Please Please Me" is released in the United Kingdom by the Beatles, with "Ask Me Why" as the B-side. 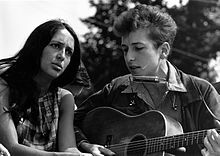 January 12 – Bob Dylan portrays a folk singer in The Madhouse of Castle Street, a radio play for the BBC in London. The Beatles achieve their first No. 1 hit single, when "Please Please Me" tops the charts in the UK. Paul Anka marries Marie-Ann DeZogheb. February 22 – The Beatles form Northern Songs Publishing Company. March 5 – 1963 Camden PA-24 crash: Patsy Cline is killed in small plane crash near Camden, Tennessee, while on her way to Nashville, Tennessee, from Kansas City, Missouri, at the height of her career, together with Cowboy Copas and Hawkshaw Hawkins. March 22 – The Beatles release their first album, Please Please Me, in the UK. March 23 – The 8th Eurovision Song Contest is held in two studios at the BBC Television Centre, London. After much confusion regarding the results of the Norwegian jury, Denmark snatches victory from Switzerland after a close run. The Danish husband-and-wife duo Grethe and Jørgen Ingmann take the prize with "Dansevise". April 29 – 19-year-old Andrew Loog Oldham signs a contract with the Rolling Stones, becoming their manager. Oldham had seen the band in concert the previous day at the Crawdaddy Club in London. May 2 – The Beatles reach number one in the UK singles chart for the second time with "From Me To You". May 11 – The Beatles album Please Please Me goes to the top of the UK Albums Chart. May 15 – Opening of the National Academic Theatre of Opera and Ballet of Mongolia. May 27 – The Freewheelin' Bob Dylan, singer-songwriter Bob Dylan's second and most influential studio album, is released by Columbia Records. The lead song, "Blowin' in the Wind", is released as a single by Peter, Paul and Mary in June and by Dylan himself in August. May 29 – On the 50th anniversary of its stormy première, 88-year-old Pierre Monteux conducts the London Symphony Orchestra in The Rite of Spring at the Royal Albert Hall, with the composer Stravinsky (81) in the audience. June 7 – The Rolling Stones' first single, a cover version of the Chuck Berry song "Come On", is released in the UK and reaches No. 21. August 3 – The Beatles perform at The Cavern Club in Liverpool for the final time. August 28 – March on Washington for Jobs and Freedom. Musical performers include Mahalia Jackson, Bob Dylan, Joan Baez, Peter, Paul and Mary and Marian Anderson. September 6 – Nippon Crown record label is established as Crown Records, a subsidiary of Columbia Music Entertainment. September 12 – The Beatles reach the UK number one for the third time with the single "She Loves You" (released on 23 August). British newspaper The Daily Mirror uses the term "Beatlemania" in a news story about the group's concert the previous day in Cheltenham; a Scottish music promoter later claims to have originated the term a week earlier. Berliner Philharmonie concert hall opens. November 30 – After an unbroken 30-week spell at the top of the UK Albums Chart, The Beatles album Please Please Me is knocked off the top of the charts by the group's latest album With the Beatles (released on 22 November). December 12 – The Beatles reach number one in the UK for the fourth time with "I Want To Hold Your Hand" (released on 29 November). Dalida is rejected by Decca in the UK again. Philips introduce the Musicassette at the Berlin Funkaustellung. Don Buchla begins to design an electronic music synthesizer in Berkeley, California. Coxsone Dodd opens the first black-owned recording studio in Jamaica, named Studio One. Lord Shorty's "Clock and Dagger" is widely considered the first soca recording. I Nyoman Rembang leaves the Surakarta Conservatorium to teach at the College of Music SMKI in Bali. As Long as She Needs Me – Sammy Davis, Jr.
Great Moments from Die Fledermaus – Sergio Franchi, Anna Moffo, Rise Stevens, etc. Sammy Davis Jr. at the Cocoanut Grove – Sammy Davis, Jr. The following singles achieved the highest chart positions in 1963. "Charade" w. Johnny Mercer m. Henry Mancini. From the film of the same name. "Flash! Bang! Wallop!" w.m. David Heneker. Introduced by Tommy Steele in the London production of the musical Half a Sixpence. Steele also performed the song in the Broadway production in 1965 and the 1967 film version (with modified lyrics). Goehr, Alexander Little Symphony 1963-07-?? Shchedrin, Rodion Naughty Limericks (Concerto for Orchestra No. 1) 1963-09-? John Serry Sr. – American Rhapsody, transcribed for free-bass accordion. Oh, What a Lovely War! (Music and Lyrics: Various Book: Charles Chilton). Opened at the Theatre Royal Stratford East on March 19 and transferred to Wyndham's Theatre, London on June 20 for a total run of 501 performances. How To Succeed In Business Without Really Trying (Music and Lyrics: Frank Loesser Book: Abe Burrows, Jack Weinstein and Willie Gilbert). London production opened at the Shaftesbury Theatre on March 28 and ran for 520 performances. March 1 – Dan Michaels, producer, saxophonist, member of the rock band The Choir and The Swirling Eddies, owner of Galaxy21 Music. October 27 – Marla Maples, American actress, musician and television personality. December 9 – Kat Bjelland, American singer, songwriter, musician and guitarist. ^ Live: Two Red Shoes Ballroom, Elgin, Scotland www.beatlesbible.com, accessed 310 March 2013. ^ a b c "The U.K. Singles Chart Number Ones". JPGR: Facts, Feats and Statistics of The Beatles. 2009. Retrieved March 30, 2012. ^ Peter Heyworth, "Young Conservatives", The Observer (14 July 1963): 27. ^ "SHCHEDRIN: Carmen Suite / Concerto for Orchestra".